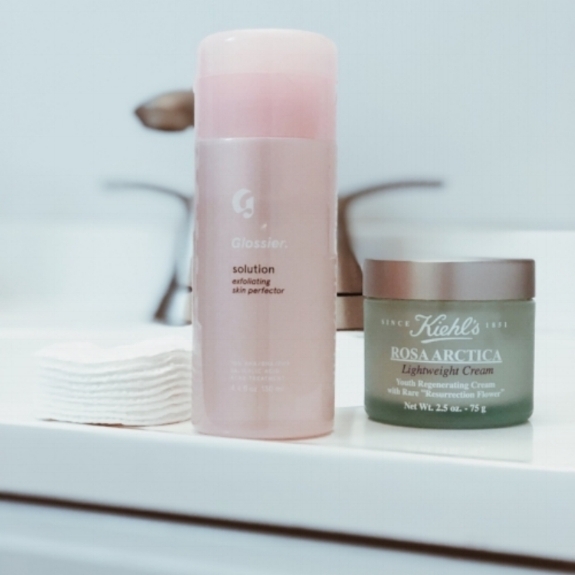 About a month ago, Glossier came out with a chemical exfoliant called Solution. Housed in a millennial pink bottle, this exfoliant seemed like it would be my skin's saving grace. I'd finally be able to have the Glossier look. If you have no idea what I mean, just look at their website. Everyone has flawless skin and their makeup products seem to cater to those who like the no makeup makeup look. Solution functions as a toner that uses the help of Alpha Hydroxy Acid (AHA), Beta Hydroxy Acid (BHA), and Polyhydroxy Acid (PHA) to give you clearer skin. How does this work? Well, these acids work on a deeper level to unclog pores and remove dead skin leaving you with tighter pores, a brighter complexion and a flawless face. _In a poll of Solution daily users with acne-prone skin, 94% said their skin was clearer (Glossier.com). After using this product for a little over a month, I feel like I fall in the unmentioned 25%. As someone who suffers from acne-prone skin and hyperpigmentation, I wanted something that would clear my pores and give me an even skin tone. Before this product, I would get my usual blackheads and whiteheads but never large pustules (what a gross word). But once I began using this product, I got clusters of large, painful, pus-filled breakouts. Of course, these freaked me out a bit since I already have extremely sensitive skin. So, I stayed up late one night researching the difference between a bad reaction and a skin purge. The difference? A skin purge typically happens with products that increase your cell turnover like those with retinoid or hydroxy acids (i.e Solution). It basically brings all your preexisting breakouts to the surface at a faster rate. A negative skin reaction happens if you're using a product that doesn't increase the cell turnover and you're experiencing breakouts in places you usually don't break out in. At this point, I'm still not sure which my skin is doing, but it doesn't matter, I had to stop using it. Even though I can agree my skin feels cleaner (and drier), looks brighter and feels softer, the constant uprisal of breakouts are doing more damage than good. With hyperpigmentation, as soon as I get a blemish I can expect a dark spot that will take months to lighten. With this product constantly producing multiple blemishes at once, I feel like it's putting me behind in the clear complexion department. I'm getting dark marks faster than I can hope to clear them and that's one of the very things I wanted this product to improve not worsen. As soon as I took Solution out of my daily routine, my breakouts have gotten better. I wouldn't necessarily say not to buy this product, unless you suffer from hyperpigmentation. If you do, DO NOT TRY. Though it didn't do all the amazing things I heard other people raving about, it still fulfilled some of the things it claimed, but ultimately, this product is not the Solution for me.